The Internet has finally woken up to the fact that that Doodle Sketch Videos are literally the *HOTTEST* way to sell anything online. And there’s a new software that puts YOU in total control of creating your own doodle style videos called ‘Easy Sketch Pro’. Easy Sketch Pro 2.0 Works on Mac, PC, or anything, and creates UNLIMITED videos, and using it’s unique ‘drag n drop’ service means you need ZERO technical skills. Within minutes you can be creating high converting hand drawn style videos. You can AUTOMATICALLY select your images, background music, enter your text, and BOOM!-Your video is ready to be uploaded to YouTube, Wista, Google or wherever you want. Drag and Drop Easy with a library of over 50 hands and styles to choose from. Upload any video and transition to sketch and back to video. Sketch on to any LIVE video! You can doodle to your hearts content with this Whiteboard Animation Software. You have to watch the video to see how cool the sketch to live video transitions are! 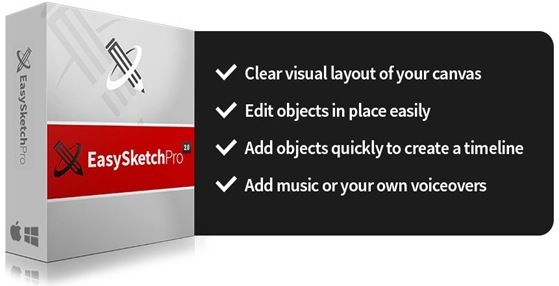 If you own the original Easy Sketch Pro, you will receive a 25% discount. Get on the Early Bird List and get your copy of this amazing new version before anyone else does. Get ahead of the competition and blow your customers away with your professionally created animated videos.